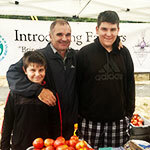 Get to know the farmers engaged in our Headwaters Farm Incubator program! Our farmers come from a wide variety of backgrounds, cultures and experiences as farmers. 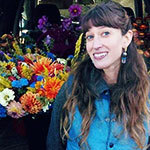 Fawn Lily Farm is a long stem cut flower farm operated by Lindsay Goldberg. She has many years of customer service experience, managerial, and organization skills. She spent five years working at plant nurseries and knows much about annual and woody perennial propagation methods. In 2013, she interned at a larger scale organic production farm and in 2014 she spent a year on a permaculture farm and nursery. Lindsay is inspired by nature and the natural process and strives to grow ethically produced flowers. Soil heath and biodiversity direct her farming methods and she is always educating herself on ways to improve. The tiny farm is diverse, with over 50 colors and varieties of flowers. As a dedicated steward of the land with values rooted in permaculture, her favorite variety is diversity. Her flowers can be found at the Portland Wholesale Flower Market and New Seasons Market. 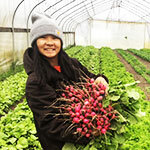 Mora Mora Farm is owned and operated by Catherine Nguyen, an East Coast native. She was introduced to farming after volunteering on a farm in southwest Virginia and was drawn by food's potential to build communities. 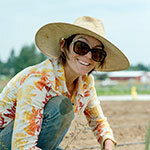 Since 2015, she has been farming on small, organic vegetable farms in Colorado and Washington, and finally decided to start a farm of her own. When she's not farming, you can find her climbing at Planet Granite, biking to the nearest coffee shop, or hanging out with her cat. 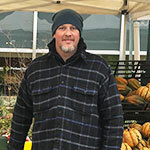 Growing on about half an acre, Mora Mora Farm sells at Portland area farmers markets, aiming to eventually expand to a CSA program and work with local nonprofits. Focused on quality greens and root vegetables, Mora Mora Farm places high value on efficient systems in order to increase its capacity for generosity and a healthy work-life balance. 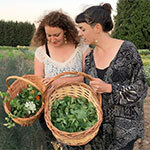 Amica Farm is the product of two hardworking, passionate and fun-loving female farmer friends: Irina and Nicki. We met during our farm internship at Zenger Farm in SE Portland in 2017. There we worked side-by-side learning, growing and developing our farm skills and dreams. Amica Farm specializes in salad mixes throughout the seasons: spicy, tender greens in Spring, colorful lettuces in Summer and hearty braising mixes through the Autumn and Winter. We also grow a wide variety of heirloom and unusual vegetables as well as the culinary staples we all rely upon. Nicki brings several years of experience in farmers market management to this partnership as well as an in depth knowledge of food preservation and a passion for food justice and farmer advocacy. Irina has had her hands in the dirt since she was a child, helping her grandparents harvest potatoes and plant leeks and lettuces. 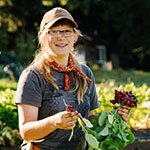 She is excited to be using the same organic farming methods that her grandparents and great-grandparents utilized in Eastern Germany to bring naturally-grown and tasty vegetables to Portlandians. Nute Family Farm is a small farm run by a small family, hoping to make a big change in the way you buy meat. 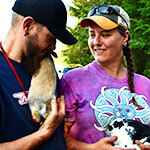 Richard and Tiffani Nute pasture raise organic rabbit and high quality poultry to sell direct to local families and chefs. The next time you're in the market for humanely raised, pasture fed, delicious and healthy meat please give the products from Nute Family Farm a try! Flying Coyote Farm is a certified organic and biodynamic farm where we are passionate about growing the highest quality food with a focus on flavor and unique and heirloom varieties. We distribute our vegetables, herbs and pasture-raised meat through our CSA Program, Farmers Markets, and local restaurants. We are excited for the opportunity to join the Headwater’s Incubator Program as a way to expand our farm’s offerings and to push ourselves to be growing on a larger more mechanized scale. For us growing food is an essential and radical act that leads to healthier communities, land, and people. To learn more about our farm and our growing practices please visit our website. Emily Cooper fell in love with farming in 2008, as a farm apprentice in Wallowa County, under the watchful eye of Chief Joseph Mountain. She now owns Full Cellar Farm, which offers produce in bulk amounts for preserving and storage. An avid farmer and canner, Emily is excited to share her experiences with her customers both in person and through her blog at www.fullcellarfarmoregon.com. 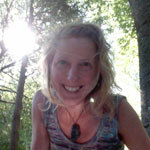 Angela LeVan is an herbalist, healer, teacher, and grower of medicines. She owns and operates Alquimia Botanicals~Fresh Medicinal Apothecary offering personalized herbal medicine in the forms of fresh, dried, and prepared medicinals. 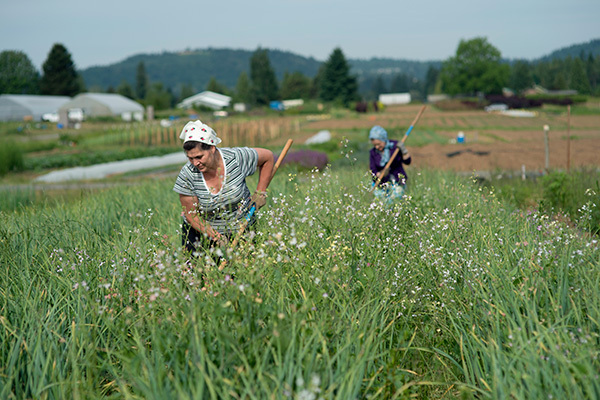 The majority of plants are grown at Headwaters Farm and through shared neighborhood gardening with InTownAg, a Portland-based garden-sharing cooperative. You can read more updates about what is available at her website Alquimia Botanicals. Alquimia Botanicals products are available at the following farmers markets: PSU Spring Market, St. John’s Market, and Montavilla Market. For over a decade, Dan Sullivan has been working on organic vegetable farms, and has also been involved in other areas of food production and marketing. Always seeking knowledge and deeper understanding, he has come to realize that with every season comes a whole new set of questions to answer. After years of operating field equipment and working on a (relatively) large scale, he began to call into question the “sustainability” of the farms he has worked for. Combined with a love of quality ingredients and for eating, Black Locust Farm is a project designed to re-assess some of the practices Dan has learned over the years by growing smaller quantities of specialty vegetables and herbs in a diversified structure. Brian and Mary's passion for farming is driven by a love of delicious and nutritious food, and for sharing the bounty of the harvest with friends. Wild Roots Farm is devoted to growing the highest-quality produce for home and professional cooks, using responsible modern techniques. "As stewards of the soil, we believe that sharing with the community is crucial, and we intend to fulfill those duties through education, outreach and charity. Our philosophy is based on our combined ten-plus year experience in growing for restaurants, CSA (CSA stands for "community-supported agriculture") and farmers markets. We believe that the future of our food systems will demand more small-scale, biologically-intensive farms focused on soil-building and high productivity." 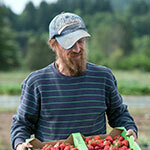 Rainbow Produce is a family farm owned and operated by Tatyana and Sergey Tkachenko. Rainbow Produce grows a variety of crops for farmers markets and the Russian-speaking community, and specializes in value-added products like sauces, pickles and sauerkraut. They are excited to be expanding production and markets this year, and to be able to provide their children with access to healthy, delicious, homegrown veggies. 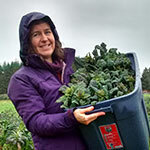 Springtail Farm, owned and operated by John Felsner and Heather Miles, is a direct market producer and seller of seasonal, northwest-adapted and mostly open pollinated herbs and vegetables. John and Heather grow over 100 varieties of 30 different crops, practicing sustainable and chemical-free growing methods with a focus on onions, potatoes, tomatoes, winter squash and seven different root vegetables. In 2015, their focus will be on winter storage vegetables and hearty greens and alliums (flowering bulb plants such as onion, garlic, chives, and leeks). Springtail Farm's mission is to primarily serve their neighbors in the Arleta and Lents neighborhoods of Portland Oregon, but they also wish to welcome any supporters in outer southeast Portland, such as the Woodstock and Powellhurst-Gilbert neighborhoods. They can also be found at the Eastmoreland and Lents International Farmers Markets in 2015, and their hearty greens, tomatoes and squash can be enjoyed at Arleta Library Café and Artigiano Italian Eatery (May - October). Glasrai is the Gaelic word for vegetable or green; the farm was named this to honor our family ancestors who homesteaded in Oregon back in the 1870s. We biointensively farm 300+ varieties of vegetable crops on 2 acres, including a hoop house. Our practices combine traditional methods with new techniques to produce high yields on small acreage, while building soil tilth using only certified organic compost, fertilizers and amendments, plus no herbicide or pesticide use. You can find us at St. Johns and Montavilla farmers markets every Saturday and Sunday May through October, then at PSU Portland Farmers Market from November through December. We have expanded sales to local restaurants by specializing in salad and braising mixes, as well as our market crop selection available for wholesale pricing. Gentle Rain Farm grows certified organic vegetables and herbs for Livin' Spoonful, maker of artisan sprouted crackers. Sue Nackoney and Jim Brosseau started Livin' Spoonful thirteen years ago with the goal of providing healthy living foods to help people thrive, and now they finally have a farm at Headwaters Incubator to grow the veggies they love so well! "Our foods are grown and handmade from our deep care for people and the earth. We provide wholesome, nourishing, simple and accessible food that supports people to be their best. " Laura and Lizzy bring many years of diverse experience to their latest endeavor. On their farm, perennial medicinal herbs grow alongside medicinal and culinary mushrooms. With an interest in contributing more perennial medicinal and culinary plants to home gardens in the Pacific Northwest, they also grow permaculture landscape plants fit for a variety of functional, productive and beautiful poly-cultures. They are excited and curious to contribute to leading-edge practices of intentionally incorporating fungi with plants, which can provide higher and more diversified yields on a small-scale farm model. 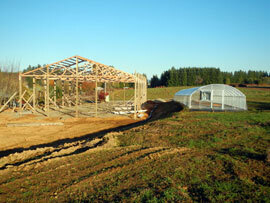 Their farm products will be sold to local herb shops, restaurants, and to community herbalists and students. 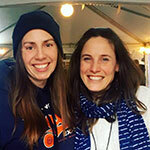 Making connections is important to both Lizzy and Laura, and they hope to share their half-acre farm space and knowledge with the local community through educational events. Lizzy comes from a more traditional small-scale farm background with over 7 years of experience as an organic farmer and farm educator. In 2015 she graduated with a degree in Agroecology, and enjoys learning new ways to connect people to food. She began studying plant medicine here in Oregon at the Elderberry School of Botanical Medicine in 2009. Her interest in herbalism and urban agriculture showed her that there is a niche for locally grown plant medicine. With a background in permaculture, mycology and design, Laura is taking the lead on the mushroom and landscape perennials on the farm. Along with her experience in sterile lab cultivation of mushroom spawn, she brings a depth of knowledge in outdoor mushroom cultivation. 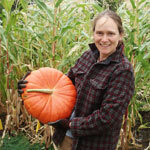 Additionally, she has several years of experience in edible landscape design and implementation, and has worked on permaculture farms in upstate New York.